"Records to Die For," but the reissue of the recently remastered version justifies its inclusion in this year's list. Jacqueline Du Pre's career lasted just 11 years, but within that space of time she achieved a reputation as one of the finest cellists of the twentieth century. Not long afer her debut in 1961, at the age of 16, she played the Elgar Cello Concerto in public for the first time with great success. In August 1965 she recorded the work for HMV. Her conductor was Sir John Barbirolli, a famous Elgar interpreter who as a young man had known the composer. Though Du Pre went on to make many other superlative recordings it is in the Elgar "Concerto", and this recording, that she is most remembered. The work's richly romantic, nostalgically autumnal mood is a fitting and appropriate memorial to an artist who performing career was cruelly cut short by a disease at the age of 42. In August 1965, Barbirolli made a second Elgar recording with another outstanding young artist, the mezzo-soprano Janet Baker, whose finely sung, imaginative interpretation of the beautiful song cycle "Sea Pictures" makes an ideal coupling for Du Pre's performance. The famous LP is available in Testament's audiophile reissue. Authentic analogue techniques have been employed in making transfers from the original recording, and high-quality 180 gram pressings have been made from virgin vinyl. The record is issued in a special limited collectors' edition. From the cello's muscular declamation that opens Elgar's Cello Concerto to the soaring flights of melody in the third movement and the contrasts between skittish optimism and contemplative melancholy in the finale, you are aware that this emotionally laden masterpiece, the last great work from the Edwardian English composer, was being performed by a mature master of the instrument. Yet when she made this recording in 1965, Jacqueline du Pré was a slightly built 20-year-old, musically wise beyond her years. I was fortunate enough to attend a master class she gave 10 years after she made this recording, when, crippled by multiple sclerosis and no longer able to play, she talked and sang the audience through the concerto's first movement; it was one of the most intensely musical performances I have experienced to this date. The late Peter W. Mitchell named the reissue of this best-selling recording one of his 1991 "Records to Die For," but the reissue of the recently remastered version justifies its inclusion in this year's list. 1884/1886: A less than 30 years Young Englishman named Edward Elgar is a violinist in the orchestra, conducted by an almost 45-year-old Czechs, Antonin Dvorak. The admiration of the younger for the elderly is life reserve inventory. In 1896 premiered under the baton of the composer in London Dvorak famoses Cellokonzert until today probably the most played its genre in the international repertoire. 1919 Cello Concerto of the now ennobled and composers of the nation is Ascended Elgar under the direction of the composer. The London Symphony Orchestra is home to a young musician named John Barbirolli. The premiere will be a flop, but already the second brings the work the breakthrough - with this Barbirolli this time as a soloist. It will in future virtually equivalent as Dvorak traded masterpiece. 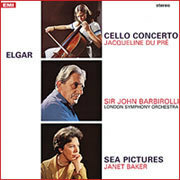 1965 Elgar's Cello Concerto is listed on again brings the most time in his home country, under the direction of a certain Sir John Barbirolli. The soloist is Jacqueline Du Pré, who has just grown to become a star cellist, and has just identified herself as Elgar's work (and eight years later she had to break her career). That same year, the circle closes permanently: It comes to the famous Record number: Elgar, played by Du Pré and the London Symphony Orchestra under the baton of Sir Barbirolli - an inspired interpretation of collector's value. Here it is again, beautiful, romantic, melancholic , Enthusiastically - and ideally complemented by Elgar's rare five-part song cycle "Sea Pictures" (1899), interpreted by Janet Baker, one of the most sought-after altists of her time.